Mr. HARRIS was for many years in business as a Saddler & Harness Maker and while he was no doubt successful in his trade, it was as a `Chucker Out` that Mr. Harris acquired fame. 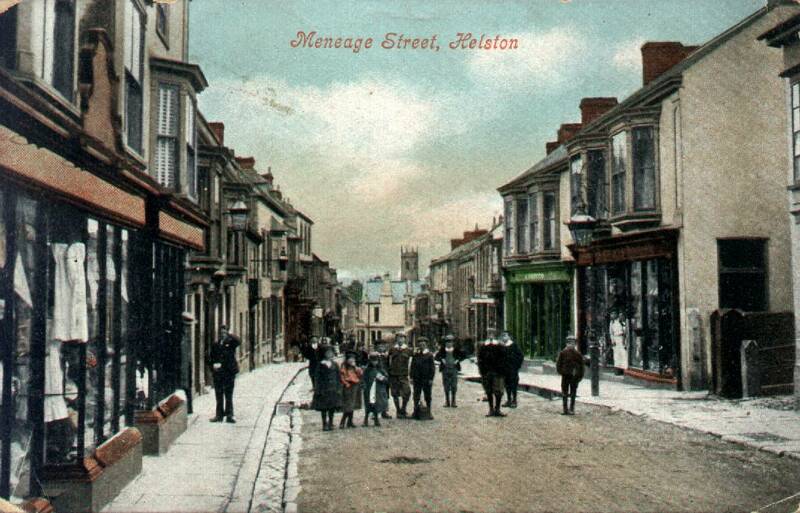 A fantastic colour postcard of Meneage Street dated 1908. It`s probably Mr. Harris himself dressed in white standing in the doorway of his shop on the righthand side of the street. This little man (I say little man because he was very short on account of his very bandy legs) was a person to be treated with great respect. In my early youth, Saturday shopping markets were largely attended and it was inevitable that certain `rough` elements should exist. 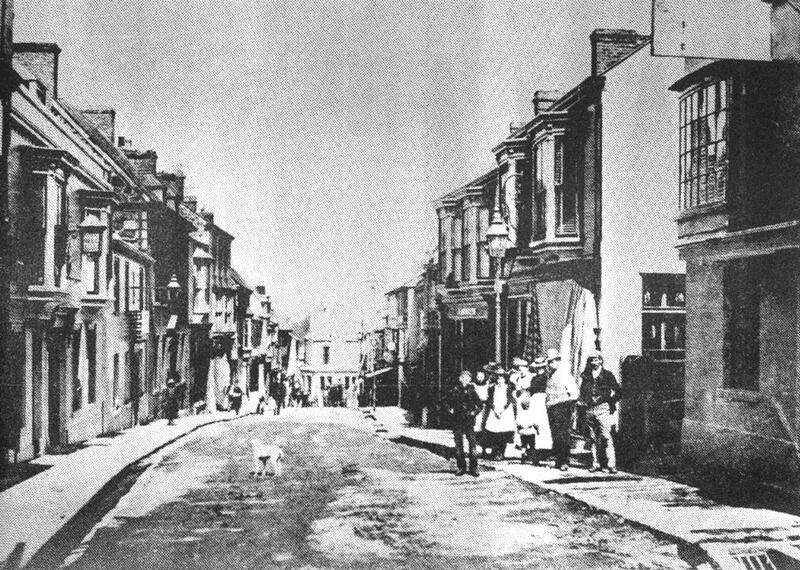 Harris’ Saddlers shop was situated only a matter of yards from three public houses, The BELL, RODNEY and HORSE & JOCKEY in Meneage Street and rowdyism often developed into `fisticuffs`. When the situation became out of hand, up would go the cry “Send for Harris” and in a matter of seconds this human hurricane would plough into the thickest of the melee’ with arms working like flails of a windmill. I`ve had one of these sessions described to me. The witness said it was just unbelievable to see great hulking men falling like ninepins under Harris’ hammer fisted blows. Mr. Harris lived at St. Day, near Redruth and he walked to Helston and back every day. The story has been told that on one occasion a reception committee of four miners lay in wait for him at Porkellis one Saturday night, thinking no doubt, to enrich themselves with Mr. Harris’ cash takings. History relates that the meeting took place as arranged, but the results were not quite as were anticipated. Mr. Harris left four very badly battered miners on the roadside to reflect and no doubt, regret their folly. A group of people standing outside Mr. Harris’ Shop at the bottom of Horse & Jockey, Meneage Street. I also heard that a tramp, a huge specimen of manhood, was begging his way and approached Mr. Harris for assistance. Mr. Harris, standing in his doorway asked why a healthy looking fellow like him (the tramp) could`nt find work. The tramp evidently resented this (what he no doubt considered was interference with his personal affairs) and he replied in sullen terms that if only he (Harris) was of his own size, he (the tramp) would……? A very disillusioned tramp picked himself out of the kennel and slunk away, wondering perhaps, what had hit him.